In this article I will cover the 2018 Kezurou-kai USA planing competition and event ceremony in Brooklyn and Peekskill, NY. The event began on Friday the 14th of September ran until Sunday the 16th. The author was in attendance on Saturday and sunday but I will cover all three days. 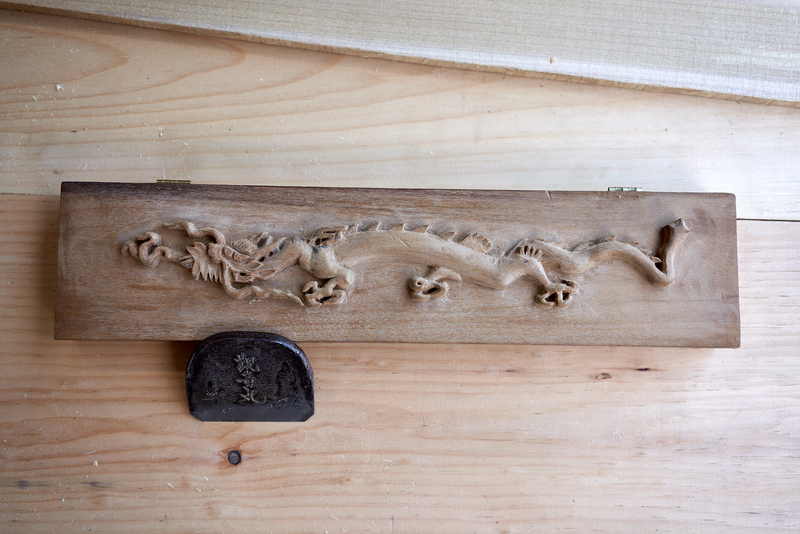 Kezurou-kai is a celebration of carpentry hand skills and building techniques, it is an opportunity for many who admire and participate in the craft to meet and enjoy the sharing of technique and experience. Workshops and talks happen throughout the weekend both to encourage new participants and to continue the conversation and education of the accomplished. The camaraderie of the craftsman is abound. At the heart of Kezurou-kai is a Japanese planing contest in which participants compete by planing a wooden beam. The thinnest shaving, full width and length of the beam, unbroken and complete, wins. This challenge is a test of the participants ability to sharpen, setup a plane body and prepare the board for best results. The photography is by Phil Ray Mahabeer of Ocular Photo. The event was hosted by Mokuchi Studio on Friday and Dain’s Lumber on Saturday and Sunday. The event started with a series of workshops, hosted at Mokuchi studio. The workshops covered aspects of both Japanese carpentry and hand tool setup. Jay van Arsdale kicked things off with a workshop on fundamental joinery and shoji. Next, Jon Stollenmeyer held court on the chona (Japanese adze). Jon detailed the process of setting up and using the adze. Karl Bareis explained traditional scale modeling of Japanese temple craft to a crowd of eager onlookers. Followed by Kohei Yamamoto who discussed the sumitsubo (ink pot) and made the sumisashi (bamboo pen). The sumitsubo and sumisashi are traditional carpentry tools used for laying out and snapping ink lines. After his presentation he guided many in making their own sumisashi. Multiple stations were setup for consecutive demonstrations. Dale Brotherton reviewed the process of dai cutting and blade sharpening. Dale is shown here carefully cutting out the mouth of the kanna dai. Andrew Hunter detailed the setup, fine tuning and use of the kanna. Jan Speetjens demonstrated sharpening and use of the yariganna, or spear plane. Saturday’s program started in the early afternoon and featured a timber raising of the building frame that was completed the week prior in classes and three demonstrations; forging with Jim Blauvelt, log beam layout and hewing with Kohei Yamamoto and Jon Stollenmeyer. Tool sellers began setting up shop to display their inventories; Mokuchi Studio, Suzuki Tool, Bluewater Forge, NanoHone, Morikuni and more were in attendance. Jon and Kohei positioned a few beams, cut the ends then began layout utilizing the techniques shown the day prior. With sumisashi and sashigane in hand, sumitsubo at arms length Jon shows the detailed layout required for making a round log into a squared beam with axe and adze. Jon began cleaving material from the beam’s side to form the first flat. Nearby Kohei demonstrated the processing of a beam which would retain a natural curve and be flat on two sides. Jim Blauvelt of Bluewater Forge brought along anvil and forge to setup a black smithing station. Jim showed the technique of forge welding steel to iron. Jim used this technique in the creation of a plane blade. Forge welding is one of many critical points in it’s production. Meanwhile, those intending to compete the following day began to setup their sharpening stations and to tune their kanna. It did not take long before an impressive showing of thin shavings began to appear. Yann Giguere of Mokuchi Studio assembled a timber framed structure completed by his students the week prior. This small building and the one from last year will be knocked down and reassembled again in it’s new location. This building was built with Japanese joinery method in which the joints are demountable, the building can be completely knocked down and reassembled multiple times. Jon Billings shown here having a swing of the ono to clean up the sides of a log under Kohei’s guidance. Andrew Hunter shown taking a swing of the axe with Jon Stollenmeyer guiding his approach. The day ended with a completed timber frame, a beautiful small structure, after which the group moved on to pizza and beer…a staple of the north east. A great time was had by all as we shared story and opinion about Japanese tools, carpentry, life in the trade and philosophy. Sunday’s event featured presentations, demonstrations and tool stations with expert accompaniment. Attendees found themselves engrossed in Japanese tools and wood craft within moments of entering Dain’s lumberyard. Anyone interested was able to try their hand at using saws, chisels planes and axes. Tool sellers and other vendors were posted near the entrance and enticed many of us into a shiny new something for the work bench. Throughout the day the sounds of planing could be heard and the contestants were back and forth from the sharpening station to the test beams each setup on saw horses. Each prepared carefully for the contest which would culminate the day’s events. Karl Bareis presented on Japanese architecture. Sayuri Suzuki, of Suzuki-Tool, presents a pair of pruners to a interested client. Suzuki sells Japanese woodworking tools, gardening and bonsai tools, kitchen cutlery and grooming tools, pretty much anything with a sharp edge hand made in Japan. Andrew Hunter prepares to take a shaving with a Ookanna, or giantic hand plane. Yann shown here cutting into a sequoia log with the maebiki nokogiri, a traditional sawyer’s tool. Kenichiro Kashida, who came from Japan for the event, shown chopping with the chona, or adze. This tool is used to further refine the surface left by the broad axe. Zoe Logan cuts along the log with the Maebiki. Eric Hartunian participates in a tenon sawing demonstration. Matt Connorton takes a moment from demonstrating chisel setup to shave a beam section with the yariganna, or spear plane. Harrelson Stanley of NanoHone shows his unique sharpening and stone maintenance products to Greg Gulch. Jon Stollenmeyer and Kohei Yamamoto present on Japanese carpentry techniques, they detailed construction method and practical aspects of timber raising. A very detailed and educational talk. Jude Noteboom studies his kanna in preparation for the competition. Brian Holcombe adjusts the blade setting. Yann Giguere drew the crowd together and announced the start of the competition. Yann made mention the efforts taken by competitors and sponsors alike in bringing the competition together. The contest grows annually and this year certainly provided a new spike in attendance. Each year competition stiffens and shavings are made ever thinner. Andrew Hunter makes the final touchup to the competition beam. Jason Forster, Oakland CA, pulling a fine shaving. Great start! Yann taking accurate measurements while Karl holds the shaving in slight tension. Jay Christian, DC area, smooth going. Yann and Karl, decisions, decisions. With every year passing, and people improving their planing, the process of judging is becoming harder and harder. A micron scale digital indicator is used to measure in the center of the shaving at the start, mid point and near to the end to judge thinness. Overall quality of the shaving is also taken into account, consistency, evenness, flatness, blemishes to determine a winner and each successive placement. Phil Fuentes takes home a DVD on Handplanes by Jay Van Arsdale. Jason Forster wins ‘The Soul of a Tree’ written by George Nakashima, sponsored by Kodansha, USA. Toshihito Imai takes home an antique Japanese felling axe sponsored by Shibui/Dane Owen. Yuko Yoshikawa, a very close 4th place, receiving a natural medium stone. Brian Holcombe wins a tomae natural stone for third place from Toshihito Imai. Kenichiro Kashida took second place and won a suita natural stone from Toshihito Imai. Jude Noteboom taking home first place. Jude won a handmade saw from Suzuki Tool. Thank you for joining us, I hope that you have enjoyed following along with this recap of Kezurou-Kai USA’s annual planing competition. We look forward to seeing you again next year. Great coverage on Kezurokai, and congrats on your fine result, Brian! Have you tried that new suita yet? Hi Carey, Good to hear from you! Thank you, actually I was using the stone today. It’s a nice medium stone. Congrats Brian! Really nice overview of the event! Thanks for the write up Brian, and congratulations on 3rd place! Thanks, Phil! Good to hear from you! Looks like a great time Brian. Thank you for sharing. Howdy Greg, Thanks for checking it out!